Not to be confused with Barony or Baronage. For the butterfly, see Euthalia nais. A baronet (/ˈbærənɪt/ or /ˈbærəˌnɛt/; abbreviated Bart or Bt) or the rare female equivalent, a baronetess (/ˈbærənɪtɪs/, /ˈbærənɪtɛs/, or /ˌbærəˈnɛtɛs/; abbreviation "Btss"), is the holder of a baronetcy, a hereditary title awarded by the British Crown. The practice of awarding baronetcies was originally introduced in England in the 14th century and was used by James I of England in 1611 as a means of raising funds. A baronetcy is the only British hereditary honour that is not a peerage, with the exception of the Anglo-Irish Black Knight, White Knight and Green Knight (of which only The Green Knight is extant). A baronet is addressed as "Sir" (just as is a knight) or "Dame" in the case of a baronetess but ranks above all knighthoods and damehoods in the Order of precedence, except for the Order of the Garter and the Order of the Thistle (and the dormant Order of St Patrick). Baronets are not deemed members of the nobility, but rather, titled gentry. Their social rank is roughly equivalent to the petty nobility in some countries of continental Europe. The term baronet has medieval origins. Sir Thomas de La More, describing the Battle of Boroughbridge, mentioned that baronets took part, along with barons and knights. Edward III is known to have created eight baronets in 1328; further creations were made in 1340, 1446 and 1551. At least one, Sir William de La Pole in 1340, was created for payment of money. Whether these early creations were hereditary, all have died out. Present-day Baronets date from 1611 when James I granted Letters Patent to 200 gentlemen of good birth with an income of at least £1,000 a year; in return for the honour, each were required to pay for the upkeep of thirty soldiers for three years amounting to £1,095, in those days a very large sum. In 1619 James I established the Baronetage of Ireland; Charles I in 1625 created the Baronetages of Scotland and Nova Scotia. The new baronets were each required to pay 2,000 marks or to support six colonial settlers for two years. Over a hundred of these baronetcies, now familiarly known as Scottish baronetcies, survive to this day. As a result of the Union of England and Scotland in 1707, all future creations were styled baronets of Great Britain. Following the Union of Great Britain and Ireland in 1801, new creations were styled as baronets of the United Kingdom. As of 2000, including baronetcies where succession was dormant or unproven, there were a total of 1,314 baronetcies divided into five classes of creation included on The Official Roll -- 146 of England, 63 of Ireland, 119 of Scotland, 133 of Great Britain and 853 of the United Kingdom. Under royal warrants of 1612 and 1613, certain privileges were accorded to baronets. Firstly, no person or persons should have place between baronets and the younger sons of peers. Secondly, the right of knighthood was established for the eldest sons of baronets (this was later revoked by George IV in 1827), and thirdly, baronets were allowed to augment their armorial bearings with the Arms of Ulster on an inescutcheon: "in a field Argent, a Hand Geules (or a bloudy hand)". These privileges were extended to baronets of Ireland, and for baronets of Scotland the privilege of depicting the Arms of Nova Scotia as an augmentation of honour. The former applies to this day for all baronets of Great Britain and of the United Kingdom created subsequently. The title of baronet was initially conferred upon noblemen who lost the right of individual summons to Parliament, and was used in this sense in a statute of Richard II. A similar title of lower rank was banneret. Since 1965 only one new baronetcy has been created, for Sir Denis Thatcher on 7 December 1990, husband of a former British Prime Minister, Margaret Thatcher (later Baroness Thatcher); their eldest son, Sir Mark Thatcher, succeeded as 2nd Baronet upon his father's death in 2003. Like knights, baronets are accorded the style "Sir" before their first name. Baronetesses in their own right use "Dame", also before their first name, while wives of baronets use "Lady" followed by the husband's (marital) surname only, this by longstanding courtesy. Wives of baronets are not baronetesses; only women holding baronetcies in their own right are so styled. Unlike knighthoods—which apply to the recipient only—a baronetcy is hereditarily entailed. The eldest son of a baronet who is born in wedlock succeeds to a baronetcy upon his father's death, but will not be officially recognised until his name is recognised by being placed on the Official Roll. With some exceptions granted with special remainder by letters patent, baronetcies descend through the male line. A full list of extant baronets appears in Burke's Peerage and Baronetage, which also published a record of extinct baronetcies. A baronetcy is not a peerage, so baronets like knights and junior members of peerage families are commoners and not peers of the realm (nb. in the UK, all people save the Sovereign and peers are considered commoners). According to the Home Office there is a tangible benefit to the honour of baronet: according to law, a baronet is entitled to have "a pall supported by two men, a principal mourner and four others" assisting at his funeral. Originally baronets also had other rights, including the right to have the eldest son knighted on his 21st birthday. However, at the beginning of George IV's reign, these rights were eroded by Orders-in-Council on the grounds that Sovereigns should not necessarily be bound by acts made by their predecessors. Baronets although never having been automatically entitled to heraldic supporters, were allowed them in heredity in the first half of the 19th century where the title holder was also a Knight Grand Cross of a Crown order. Baronets of Scotland or Nova Scotia were allowed to augment their armorial bearings with the Arms of Nova Scotia and the privilege of wearing a neck badge signifying "of Nova Scotia", suspended by an orange-tawny ribbon. This consists of an escutcheon Argent with a Saltire Azure, an inescutcheon of the Royal Arms of Scotland, with an Imperial Crown above the escutcheon, and encircled with the motto Fax Mentis Honestae Gloria. This badge may be shown suspended by the ribbon below the escutcheon. Baronets of England and Ireland applied to King Charles I for permission to wear a badge. Although a badge was worn in the 17th century, it was not until 1929 that King George V granted permission for all baronets (other than those of Scotland) to wear badges. A baronet is referred to and addressed as, for example, "Sir <Joseph>" (using his forename). The correct style on an envelope for a baronet who has no other titles is "Sir <Joseph Bloggs>, Bt." or "Sir <Joseph Bloggs>, Bart." The letter would commence: "Dear Sir <Joseph>". The wife of a baronet is addressed and referred to as "Lady <Bloggs>"; at the head of a letter as "Dear Lady <Bloggs>". Her given name is used only when necessary to distinguish between two holders of the same title. For example, if a baronet has died and the title has passed to his son, the widow (the new baronet's mother) will remain "Lady <Bloggs>" if he is unmarried, but if he is married his wife becomes "Lady <Bloggs>" while his mother will be known by the style "<Alice>, Lady <Bloggs>". Alternatively, the mother may prefer to be known as "The Dowager Lady <Bloggs>". A previous wife will also become "<Alice>, Lady Bloggs" to distinguish her from the current wife of the incumbent baronet. She would not be "Lady <Alice> <Bloggs>", a style reserved for the daughters of peers. The children of a baronet are not entitled to the use of any courtesy titles. For a baronetess one should write "Dame <Daisy Smith>, Btss" on the envelope. At the head of the letter, one would write "Dear Dame <Daisy>," and to refer to her, one would say "Dame <Daisy>" or "Dame <Daisy Smith>" (never "Dame <Smith>"). Dame Anne Maxwell Macdonald, 11th Btss (1906–2011) was recognised by the Lyon Court in 2005 as 11th holder of the baronetcy (formerly Stirling-Maxwell) under the 1707 remainder and succeeded her father in 1956. In 1976 Lord Lyon King of Arms stated that, without examining the patent of every Scottish baronetcy, he was not in a position to confirm that only these four title creations could pass through female lines. As of 2016, there are no living baronetesses. All baronetcies are created with a territorial sub-designation, however only more recent creations duplicating the original creation require territorial designations. 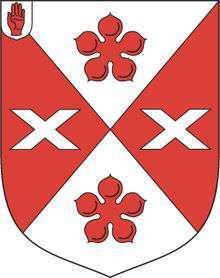 So, for example, there are baronetcies Moore of Colchester, Moore of Hancox, Moore of Kyleburn, and Moore of Moore Lodge. Baronets of England, Ireland, Great Britain or the United Kingdom (i.e. 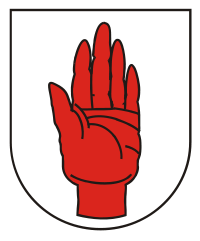 all except baronets of Nova Scotia) can display the Red Hand of Ulster (sinister (left) hand version) as a heraldic badge, being the arms of the ancient kings of Ulster. This badge (or augmentation of honour) is blazoned as follows: Argent a Hand sinister couped at the wrist extended in pale Gules. 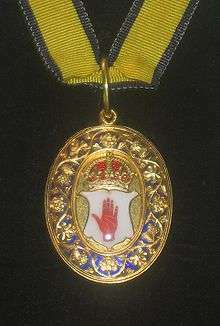 King James I of England established the hereditary Order of Baronets in England on 22 May 1611, in the words of Collins' Peerage (1741): "for the plantation and protection of the whole Kingdom of Ireland, but more especially for the defence and security of the Province of Ulster, and therefore for their distinction those of this order and their descendants may bear the badge (Red Hand of Ulster) in their coats of arms either in canton or an escutcheon at their election". Since 1929 such baronets may also display the Red Hand of Ulster on its own as a badge, suspended by a ribbon below the shield of arms. 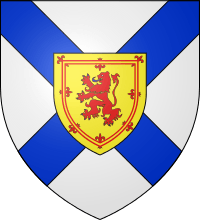 Baronets of Nova Scotia, unlike other baronets, do not use the Baronet's Badge (of Ulster), but have their own badge showing the Coat of arms of Nova Scotia: Argent, a Saltire Azure with an inescutcheon of the Royal Arms of Scotland. From before 1929 to the present it has been customary practice for such baronets to display this badge on its own suspended by the order's ribbon below the shield of arms. The first publication listing all baronetcies ever created was C. J. Parry's Index of Baronetcy Creations (1967). This listed them in alphabetical order, other than the last five creations (Dodds of West Chillington, Redmayne of Rushcliffe, Pearson of Gressingham, Finlay of Epping and Thatcher of Scotney). It showed the total number created from 1611 to 1964 to have been 3,482. They include five of Oliver Cromwell, several of which were recreated by Charles II. Twenty-five were created between 1688 and 1784 by James II in exile after his dethronement, by his son James Stuart ("The Old Pretender") and his grandson Charles Edward Stuart ("Bonny Prince Charlie"). These "Jacobite baronetcies" were never accepted by the English Crown, have all disappeared and should properly be excluded from the 3,482, making the effective number of creations 3,457. A close examination of Parry's publication shows he missed one or two, so there may well have been some more. The total number of baronetcies today is approximately 1,270, although only some 1,020 are on The Official Roll of the Baronetage. It is unknown whether some baronetcies remain extant and it may be that nobody can prove himself to be the actual heir. Over 200 baronetcies are now held by peers and others, such as the Knox line, have been made tenuous due to internal family dispute. There were 1,490 baronetcies extant on 1 January 1965 since when there has been a loss of about 260 baronetcies through extinction or dormancy resulting in a gross decline of 17.5% or almost one sixth over 50 years. Thus the net loss is 254 or 17.1%. Extant baronetcies number about 1,236 (as of 2015). The Premier Baronet (of England) is the unofficial title afforded to the current holder of the oldest extant baronetcy in the realm. The Premier Baronet is regarded as the senior member of the Baronetage, and ranks above other baronets (unless they hold a peerage title) in the United Kingdom Order of Precedence. Sir Nicholas Bacon, 14th Baronet, is the current Premier Baronet, whose family's senior title was created by King James I in 1611. 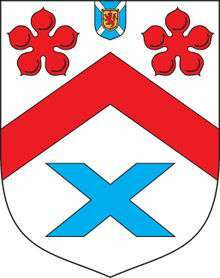 The Premier Baronets of Nova Scotia (Scotland) were the Gordon baronets of Gordonstoun and Letterfourie until the title's extinction in 1908. Subsequently, the Premier Scottish Baronets are the Innes baronets of that Ilk (cr. 28 May 1625), the present Premier Baronet being Guy Innes-Ker, 10th Duke of Roxburghe. The Premier Baronetcy of Ireland was created for Sir Dominic Sarsfield in 1619, and was held by his successors until the attainder of the 4th Viscount Sarsfield in 1691. Since then the descendants of Sir Francis Annesley Bt., the Annesley baronets, have been the Premier Baronets of Ireland; presently Francis William Dighton Annesley, 16th Viscount Valentia. 1 2 "Baronet". Collins Dictionary. n.d. Retrieved 23 September 2014. ↑ "Baronetess". Dictionary.com Unabridged. n.d. Retrieved 15 August 2016. ↑ "Baronetess". Collins Dictionary. n.d. Retrieved 23 September 2014. ↑ Debrett's Correct Form. Addressing the family of a Baronet. 1 2 Sir Martin Lindsay of Dowhill, Bt (1979). The Baronetage, 2nd edition. ↑ "Baronetage decline since 1965". Retrieved 21 September 2015. ↑ "Baronial family von Friesendorff" (in Swedish). The House of Knights. Archived from the original on 3 December 2013. Retrieved 30 November 2013. Sir Martin Lindsay of Dowhill, Bt (1979). The Baronetage, 2nd edition. (published by the author). William Stubbs (1883). Chronicles of the Reigns of Edward I and Edward II, Vol. 2, Part IV - Vita Et Mors Edwardi II Conscripta A Thoma de La More. Longman & Co.
Wikisource has the text of the 1911 Encyclopædia Britannica article Baronet.